Roughly 13.8 billion years ago, the Universe as we know it expanded from an infinitely hot and dense singularity in space and time, first in a furious torrent of rapid cosmic inflation for a fraction of a second, and then in the more calm manner we see today – gradual, yet accelerating expansion fueled by dark energy. This fleetingly describes the Big Bang model of cosmology, the most successful theoretical explanation for our grand Universe. Backed by boatloads of observational evidence, we can be very sure of its veracity. Caltech astrophysicist Sean Caroll even described the Big Bang as "100 percent true." But that percentage of surety dwindles to nothing when discussing the singularity that supposedly started it all. Where did it come from? What came before it? What caused it to "bang" in such a big way? As Carroll admitted, this singularity and its accompanying "bang" are essentially stand-ins for what we don't – and currently can't – actually know. “It’s the time at which we don’t understand what the Universe was doing," he said on Science Friday. And we might not ever understand it, at least with current methods of observation. "The exponential nature of inflation wipes out any information that occurred prior to that, separating it from anything we can observe by, well, inflating it beyond the portion of our Universe that we can observe," astrophysicist Ethan Siegel wrote. We're at a dead end, it seems. "It certainly looks like the universe that we observe around us… definitely had a beginning," MIT cosmologist Alan Guth, the originator of the theory of cosmic inflation, said in an interview for the PBS show Closer to Truth. "That doesn't mean that that beginning was necessarily the ultimate beginning of all of reality. There may have been some prehistory to what we're here calling the beginning." Fanciful ideas abound to account for that prehistory. Eternal inflation suggests that our universe is but a mere bubble in what physicist Matt Francis described as a "larger froth of inflation" of an even grander universe. Cyclic inflation proffers that our observable universe is the region in between two membranes of parallel shadow universes. Another theory proposes that our universe emerged from the singularity of a black hole and we are contained within the event horizon. 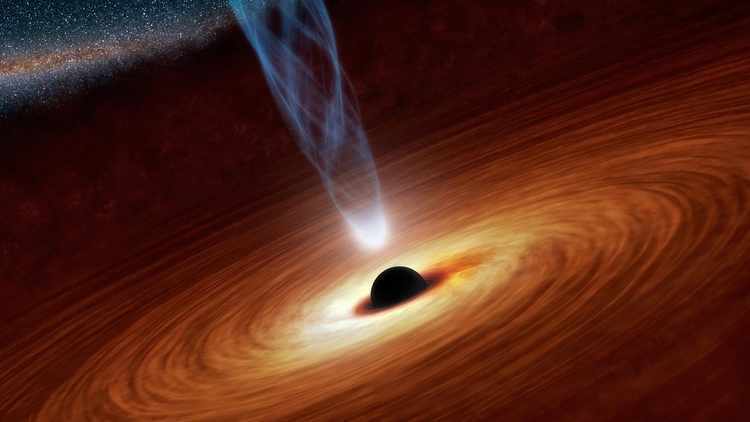 This illustration released by NASA, shows a supermassive black hole in the nearby spiral galaxy NGC 1365. All of these ideas sound cool, but none are reasonably testable, rendering them useless at the present time. They share this state of futility with the Big Bang's theorized singularity and all other explanations for how everything really began. Ethan Siegel explained why, and what this means. The total amount of information accessible to us in the Universe is finite, and hence, so is the amount of knowledge we can gain about it. There's a limit to the amount of energy we can access, the particles we can observe and the measurements we can make. There's a whole lot left to learn and a whole lot that science has yet to reveal, and many of the present unknowns will fall in the near future. But some things we will likely never know. We will likely never know for sure how everything began, or even if there was a beginning. Perhaps the timeless quest to uncover our ultimate origins is pointless, a selfish side effect of our innate human need for a coherent narrative of existence. Indeed, the very concept of a beginning may be flawed, based on our comparatively paltry experience in this mystical reality. The Universe, and indeed all of Reality, is by no means required to conform to our concept of a "beginning". And of course, no matter how far down the rabbit hole we travel, there could always be a question of "what came before?" The search for a beginning will likely never end.